Ever since the icebergs started melting, a few months later, space became a really big problem for the penguins. Now it is a situation of survival of the fittest so you will team up with them and start conquering and gaining territory for your fellow clan members. Try to have as few casualties within your troops and sink the other penguins with as few shots as possible. Drag the aiming bar to set the angle and power of the shot, and when it is calibrated fire the snowball. Also you will have special weapons that you will need on the battlefield when they are outnumbering you heavily. 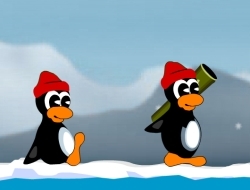 Lead your penguins to victory and wear those cute Santa hats with pride. Use the mouse to drag the angle and power bar, then click the button to Fire. Conquer Antarctica 0.00 between 0 and 10 based on 0 votes.